Home On Campus Smartphones: Friend or Foe? Do Smartphones Affect Student Academics? Smartphones: Friend or Foe? Do Smartphones Affect Student Academics? To help discover the truth about smartphone usage among Bloomsburg University undergraduate students we performed several field observations as part of the special BUnow coverage of smartphone use. We focused on academic areas such as classes and the library gathering place. We created a chart to tally how students used their phones in these places and then observed. For the library/gathering place, we tallied the total number of students seen, the students actually talking on their phone, students using their phones for texting and apps, students with headphones in, and finally, students who were not on the phone at all. We observed at different times and on different days to increase representation. For in class observations, we counted the number of students in the class, how many used their phones while waiting for class to start, how many used them during class, and how many had their phones on their desks during class. A total of 282 students were observed. At the library, 217 students were observed. Of those students, only 11 (5%) were actually talking on the phone, 89 (41%) were texting or using applications, 34 (16%) had headphones in, and 83 (38%) did not have their phones out. Students used their phones while walking and while sitting with others in a group. Almost everyone who was sitting down and attempting to do work or study had their phones out and checked them periodically. Some students remained on their phones for several minutes before returning to work. In class observations included 65 students. 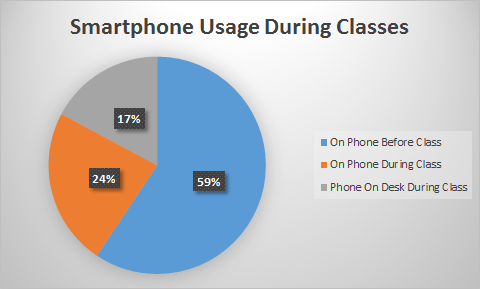 Before class, 38 (59%) students were on their phones, 15 (24%) used them during class, and 11 (17%) had their phones on their desks. Some students chatted with other people while on their phones, but others only looked down at their screens. Students have no problem using their phones during class, and it seems professors don’t think it’s an issue either. One of the classes we observed had a rule against phone usage during class; however, about 20% of the students in the class still used their phone and were met with no repercussions. The results of our observations showed the vast majority of students have their phones with them all the time, including study and class time. Most students do not typically use their phones to make calls, but prefer to text. There is no time where smartphones are completely off limits. Students are not afraid to use their phones during classes and they do not mind using them instead of talking to their peers. They are quick distractions from long study sessions. Smartphones have become ubiquitous in our society, and through our observations, we could see both benefits and issues they can cause with students. Smartphones can improve study time because they provide quick access to information. There are also some applications that force users to not touch their phone for a certain amount of time in an effort to increase productivity. One of these applications is called “Forest” and it allows users to grow trees on their phone by not touching it for anywhere from 20 minutes to 4 hours. These types of applications use technology in order to not use technology, which is interesting. On the other hand, smartphones often distract from academic work. Students may become caught up in social media or games just to procrastinate. Smartphones help you stay connected to friends and family, but they also cause some social issues; instead of talking to friends or people in class, some students will immerse themselves social media. Smartphones impact every area of students’ lives and Bloomsburg University is no different. Students are often among the first adopters when it comes to new technology. The smartphone will continue to evolve and so will its usage. Whether it’s in class or at the library, it will be there offering benefits or distraction. This article is one of several in a series on smartphone usage at Bloomsburg University. This series was conducted as a BUnow editorial partnership with Dr. Ganahl’s MassComm research students. Smartphones are steadily becoming a large part of student life, both on- and off-campus. 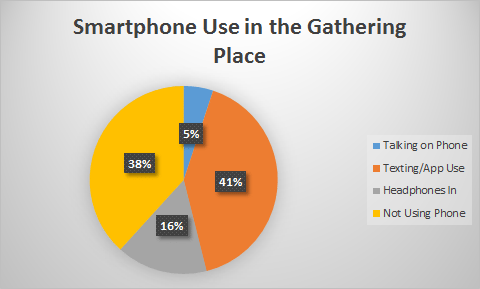 We aim to study this integration, as well as uncover trends in the ways Bloomsburg University students use their smartphones. We hope the information we discover will be of use to the Bloomsburg population, and that this information will help us all gain insight into how we use our smartphones. Next articleSmartphones: Friend or Foe? Are College Students Addicted to the Latest Technology?